I know this is super old but I also just saw this and I'm pretty well versed in firearms, I can lend a hand. 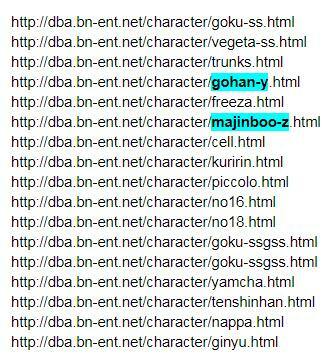 These definitely hint at multiple versions for Gohan and Boo. I'd imagine it'll be Ultimate Gohan and either Kid or Super Boo. I'm pretty out of the loop as far as the characters being included in the game. Which ones (to our knowledge) are coming with the base game and which are arriving as DLC? I'm assuming that 24 character roster is the final count once everything is released? I think a more ideal solution would be for the forum to just offer a selection of stock portrait avatars from the the source material you suggested. The first clip is from the Carpenter's album Lost Themes titled Vortex. Can't seem to identify the second one. I don't post that much anymore but I just wanted to come here and say I'm glad you're still active with this series and I'm looking forward to your marathon this December. Topic: What is Son Goku's real skin color? Re: What is Son Goku's real skin color? It seems like Toriyama treats his skin color a bit like the color palettes of various clothes and hairs of the series; causally inconsistent. Though officially it seems like "yellow" is the answer to your question. Topic: Thoughts on A hero's legacy ? Re: Thoughts on A hero's legacy ? Topic: Why was the 3DO game cancelled? Re: Why was the 3DO game cancelled? Someone at Bandai had foresight. TBH, Scarz that ball crunch was pretty fucked up. I can't exactly remember the context of when the Dodonpa was said to be stronger than the Kamehameha, but I always just assumed that was just big talk by the Crane School. Topic: Expected to like "adult" cartoons over DB? Re: Expected to like "adult" cartoons over DB? Just like whatever you like and dame anyone who says otherwise. As long as your relatively normal about it, I'd imagine no one would really care. Topic: Could Gohan really carry the series. Re: Could Gohan really carry the series. Topic: What's your opinion on the new characters? Re: What's your opinion on the new characters? Topic: Did the Android arc mark the downfall of Dragon Ball? Re: Did the Android arc mark the downfall of Dragon Ball?